Probably yes, it was very expensive , over 3000€ in 2003 for fitment, adjusting/tuning and adding a second accelerator pump witch was necessary somehow. Check the oil on the right of the bike there's a cut out in the fairing. Filling the oil can be "challenging". 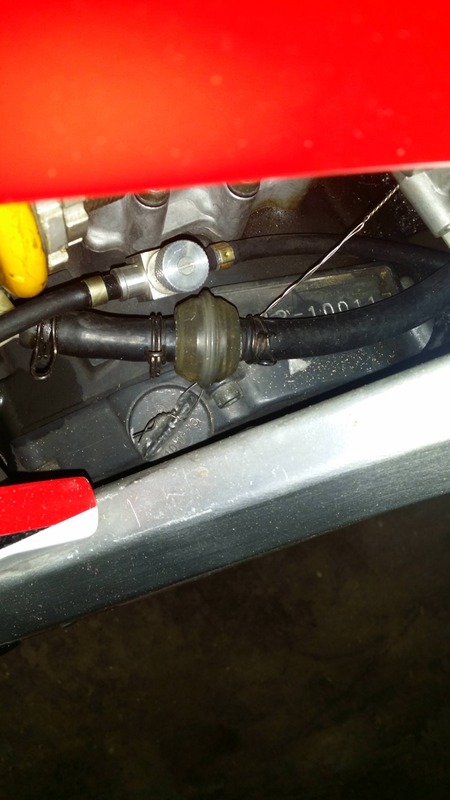 Either use a mini ratchet and allen bit to get the oil filler out (under the right frame spar on top of the clutch), then use a small funnel with a rubber tube on the end. Or take the seat unit and tank off and fill it through the crank case breather at the top of the engine. You can use a bigger funnel and wider rubber hose with a clip on it - I use this to fill when changing the oil. Water … coolant under the fuel tank at the front you'll see the radiator filler - check there, it should be full. I wouldn't worry to much about the expansion tank (its on top of the headlights under the firing) if you put anything in there it fire out the first time it heats up it's not worth arguing with the bike over this. Changing the coolant - drain it by undoing a hose stand the bike up then put it on the stand. Fill it through the rad cap - run the engine with the rad cap off, top it up a little at a time and wait for the bubbles to stop, then put the cap on. EC’s got all the right answers there . For the oil leak.... probably best to remove the fairing for a good look. Depending on where the puddle forms, maybe a seal.... gear shift rod, output shaft, clutch push rod? Take the fairing off - raise the front wheel if you can, I use an Abba front stand, but I think they stopped making them. Any of those seals is going to be engine out or at least half dropping it. leave it till the winter. I wouldn't worry to much about the expansion tank (its on top of the headlights under the firing) if you put anything in there it fire out the first time it heats up it's not worth arguing with the bike over this. My Bimota guy managed to fill it up properly; he warned me not to touch the filler cap near the steering head again. The trick is apparently to fill it up and let it bubble till quiet, then fill it to the brim, close the cap and fill up the expansion tank. I presume the bike is on the paddock stand during that process. If you fill too much the tank will spill the excess, but after that there will be a few centimeters of fluid in that tank permanently. With the bike on the jiffy you should see about an inch of fluid on the lower (i.e. left) side when the engine is cold. To be sure: this is on the SB6R. Not sure if the 6 is the same, but I'd expect so. Check the oil on the right of the bike there's a cut out in the fairing. Thank you, the oil sight glas apears to be compleatly empty. The engin oil lamp has not come on yet. I'll strip the ferring and have a look. Why is it not recommended/possible to fill the oil up threw the oil screw? Also, what oil is recommended? You can (obviously) fill it through there but you need a funnel with a rubber pipe on it. The pipe dia needs to fit in the filler hole and funnel needs to fit in the pipe, so you end up with a small funnel. It takes a lot longer thats all.